DAYTONA BEACH, Fla. (August 29, 2017) – This weekend, American Flat Track heads to the Illinois State Fairgrounds in Springfield, Ill., for the Labor Day weekend edition of the legendary Springfield Mile. It’s twice the action this year with the “Rising Stars” of the AFT Singles class sparring on the Short Track on Saturday, September 2, and the AFT Twins presented by Vance & Hines class battling on the big track at the Harley-Davidson Springfield Mile II on Sunday, September 3. The Springfield Mile is rich with history and everyone will be looking to take home victory at the 98th running of the event. Looking to repeat last year’s Springfield Mile II win is Kenny Coolbeth, Jr. (No. 2 Harley-Davidson Factory Flat Track Team XG750R). The veteran has had a lot of success at Springfield – a total of five wins – and he repeated some of that success by winning his Heat race at Springfield earlier this May. A win this year would go a long way towards getting the three-time Champion back on track. It would also be a big boost to the Harley-Davidson Factory squad who have been working hard all season developing the new XG750R. Teammates Jake Johnson (No. 5 Harley-Davidson Factory Flat Track Team XG750R) and Brandon Robinson (No. 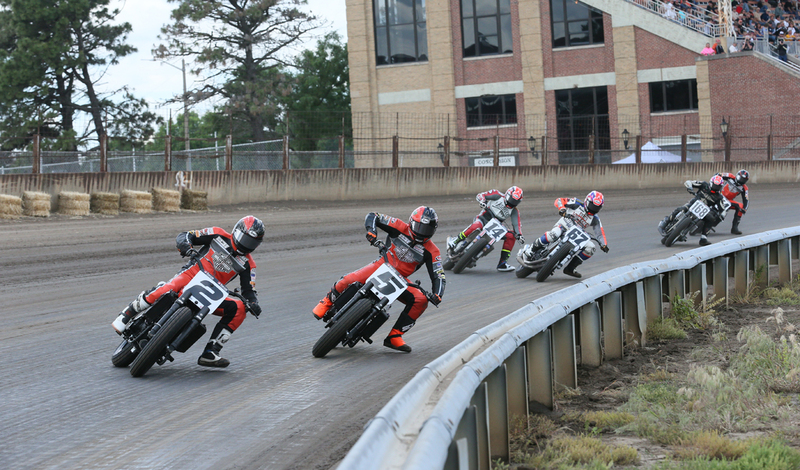 44 Harley-Davidson Factory Flat Track Team XG750R) have a pair of wins at the Springfield Mile and they too will be vying for the win at the legendary track. But at the end of the day, no current rider in the Grand National Championship has more wins than the defending champ – Bryan Smith (No. 1 Indian Motorcycle Racing backed by Allstate Scout FTR750). While a win for Coolbeth would be a big boost for him and his squad, a win for Smith is a vital shot in the arm for the “Mile Master’s” hopes of defending his title. And for Smith, there’s no better place to bolster his title defense than where he feels at home with seven career wins at the Springfield Mile. Smith’s title rival Jared Mees (No. 9 Indian Motorcycle Rogers Racing Scout FTR750) heads to Springfield with a 41-point advantage. While Mees doesn’t want to talk championship yet, he is very much set on taking another Mile win on his rival’s turf; and he has won there before. There are a host of riders, however, looking for their first win at the Springfield Mile: Brad Baker (No. 6 Indian Motorcycle Racing backed by Allstate Scout FTR750), Sammy Halbert (No. 69 Estenson Logistics Yamaha FZ-07), Jeffrey Carver Jr. (No. 23 Carver’s BBQ Kawasaki Ninja 650) and Davis Fisher (No. 67 Bob Lanphere Beaverton Motorcycles Kawasaki Ninja 650). They were all in the mix earlier this May and are eager to pull off the upset. After a five-year absence, the Springfield ST returns to American Flat Track competition with the AFT Singles class. Leading the way is points leader Shayna Texter (No. 52 Richie Morris Racing Honda CRF450R). Texter podiumed earlier this season at the Atlanta Short Track and looks to build on that finish with her first career Short Track win. Trailing Texter by a mere two points is Kolby Carlile (No. 36 Estenson Racing Yamaha YZ450F). A win at Springfield would be pivotal for Carlile’s championship charge as the series hits the final stretch where Texter feels quite at home – the Half-Miles. Also looking to make forward progress in the title chase is Brandon Price on the No. 92 Brandon Price Racing backed by Parkinson Brother’s Racing/DPC Racing/Don’s Kawasaki Honda CRF450R. Price is well in the hunt for the championship, sitting just 10-points behind Texter. Although not in the championship battle, Dan Bromley (No. 62 Big Momma & Daddy Deep Pockets Racing KTM450 SX-F) is poised to spoil the frontrunners’ party and end his win drought. Bromley topped the Singles-class podium in the series’ last outing at the Springfield ST in 2012. The Pennsylvania rider has been building momentum in his return to AFT Singles competition, with a second-place finish at the Buffalo Chip TT and was just shy of the podium at the Black Hills Half-Mile. This year’s race will feature bikes of the past competing on the same turf as the best flat track machines of today with a vintage support class added to the program. The vintage class will have two heat races separated by categories – tank shifters and foot shifters – and a combined Main event. To highlight the vintage experience, a 1936 Harley-Davidson RLDR that raced at the inaugural Springfield Mile in 1937 will be on display and lead the parade lap during Opening Ceremonies. For $10 fans can join in on the fun and ride the Mile. The ride is sponsored by ABATE of Illinois with all money donated to charity. There will also be a ride and park display of vintage motorcycles on the north end of the grandstand, sponsored by Vintage Iron Riders. To add to the festivities at one of flat track’s most celebrated venues, there will be a band playing under the pavilion from 10:00 a.m. CT to 1:00 p.m. CT, as well as a bike giveaway with the ABATE bike raffle. On-track action begins on Saturday, September 2, with AFT Singles practice sessions for the Springfield ST at 2:00 p.m. CT and Opening Ceremonies commencing at 6:30 p.m. CT. Then on Sunday, September 3, head over to the big track for the Harley-Davidson Springfield Mile II. Gates open for fans at 9:00 a.m. CT with on track action kicking off for AFT Twins practice sessions at 10:00 am CT and Opening Ceremonies at 1:00 p.m. CT.